Kashagan, first oil volumes produced. The North Caspian Operating Company (NCOC) has reported the first oil has been extracted from Kazakhstan’s massive offshore Kashagan field. 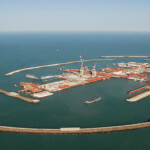 The Kashagan field in the Caspian Sea has an estimated 4.8 billion tons of oil reserves as well as natural gas. Production at the site is years behind schedule. Partners in the NCOC are KazMunaiGaz, Italy’s Eni, France’s Total, the Anglo-Dutch company Royal Dutch Shell, the U.S. company ExxonMobil, and Japan’s Inpex. Kazakhstan recently used its preemptive right to purchase a 8.45 percent share from ConocoPhillips and reports indicate Kazakh authorities will sell that stake to the China National Petroleum Corporation.